Cross tabulations can be done in the automatic evaluation of your survey. To do so, you just have to click on the answer you want to focus on. For example, having a gender question in your questionnaire, you can easily narrow down the evaluation to only female participants. 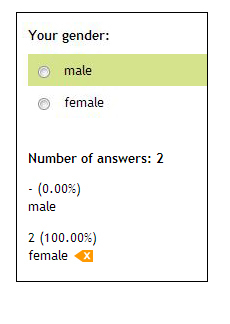 By clicking on “female”, only answers of female respondents will be displayed. You can define as many filters as you like, e.g. additional filters for the age, marital status, or whatever other questions you have in your questionnaire. In the top area of your evaluation you will see your active filters listed. They are also shown in the affected element/question. With just one click on the orange arrow directly aside a respective responding possibility the filters can be deleted. Next Next post: Can a survey be conducted anonymously?